The meta title of your page has a length of 49 characters. Most search engines will truncate meta titles to 70 characters. The meta description of your page has a length of 163 characters. Most search engines will truncate meta descriptions to 160 characters. Tvorba web stránok. Pomôžeme vám zvyditeľniť sa. Vďaka responzívnej webovej stránke dokážete zaujať zákazníkov rýchlejšie ako kedykoľvek predtým. A Google Analytics script is not detected on this page. While there are several tools available to monitor your site's visitors and traffic sources, Google Analytics is a free, commonly recommended program to help diagnose potential SEO issues. Congratulations! Your webpage is successfully compressed using gzip compression on your code. Your HTML is compressed from 1773.2 Kb to 215.42 Kb (88% size savings). This helps ensure a faster loading webpage and improved user experience. Your website loading time is around 4.03 seconds and this is under the average loading speed which is 5 seconds. Congratulations, your page has fewer than 20 http requests. A higher number of http requests results in a user's browser needing to request a large number of objects from your server, which will ultimately slow down the loading of your web page. Your webpage is not using uncached CSS resources from your domain. Your webpage is not using CSS resources from the same domain. Your URL performed 1 redirects! While redirects are typically not advisable (as they can affect search engine indexing issues and adversely affect site loading time), one redirect may be acceptable, particularly if the URL is redirecting from a non-www version to its www version, or vice-versa. 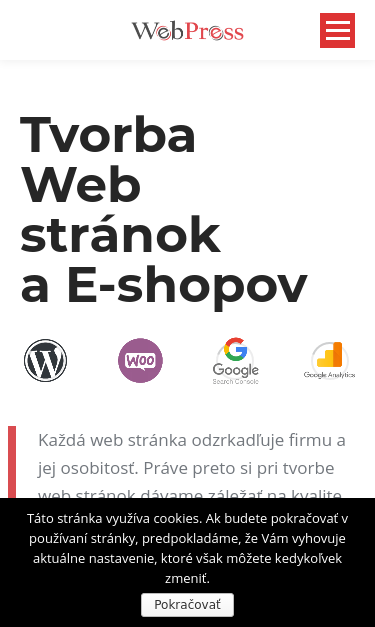 https://webpress.sk/tvorba-web-stranok and https://www.webpress.sk/tvorba-web-stranok resolve to the same URL. Congratulations, your server signature is off. Your webpage is using the canonical link tag. This tag specifies that the URL: https://webpress.sk/tvorba-web-stranok is preferred to be used in search results. Please ensure that this specification is correct, as canonical tags are often hard-coded and may not always reflect the latest changes in a site's URL structure. Your webpage is using the nofollow meta tag. You are advised to use this tag carefully since search engines will not crawl all links from your webpage. If you want search engines to crawl all the outgoing links on your webpage you must remove the nofollow meta tag.